Game Two was so much better than Game One for the St. Louis Cardinals, to state the absolute obvious. Then again, winning has a way of making everything better, doesn’t it? And the Cardinals were definitely better last night as they beat the Boston Red Sox 4-2 and tied the World Series at one win each. As it unfolded, Game Two also taught us some valuable lessons. Such as lesson one: a “bad” Michael Wacha is still really, really good. Last night was Wacha’s worst start since mid-September and, obviously, still incredibly impressive. Yes, his October has been so unbelievable that we have to go back to Sept. 19 to find a game in which Wacha allowed more than the two earned runs he gave up on one swing by David Ortiz last night. And the only other time in his short big league career that he walked four, as he did last night, was on Sept. 14 against the Mariners. Yet even with those “bad” numbers from last night, Wacha gave up only three hits, struck out six and won his fourth game in October — and the Cardinals have won eight games this month so far. He’s been so very good that, going back to his final regular season start (his near no-hitter against the Nationals) through last night, he’s allowed just three runs in 35 2/3 innings pitched for a 0.78 ERA and struck out 37. Lesson two: Carlos Beltran doesn’t care about pain, not when it’s the World Series. ”Somebody would have to kill me in order for me to get out of the lineup,” said Beltran, undeterred by bruised ribs that landed him in the hospital a night earlier. Yes, Beltran was back in the lineup for Game Two — and making his usual impact. He singled in his first at-bat, then singled again in the pivotal seventh inning to drive in Daniel Descalso and the Cards fourth run of the game … all with bruised ribs, remember. ”The good thing is tomorrow I have the day off,” he said. Lesson three: Matt Holliday likes facing the Red Sox. After going two for four in Game One with a homer to keep the Cardinals from being shut out, Holliday tripled off the center field wall to lead off the fourth inning of Game Two. He scored on a Yadier Molina groundout to give the Cards a 1-0 lead. Holliday’s hitting .320 against the Sox for his career, including .375 so far in this World Series. Lesson four: double steals are awesome. That doesn’t really need much more explanation, since they just are. But in the seventh inning, after a one-out walk to David Freese, Pete Kozma replaced him as a pinch-runner and moved up to second on a Jon Jay single. 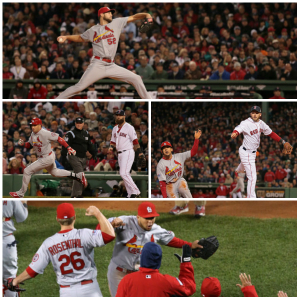 With Craig Breslow taking over for John Lackey on the mound, Kozma faked a steal on a 1-0 count. Then, after the count reached 2-2, Kozma and Jay both took off and easily stole third and second after Jarrod Saltalamacchia couldn’t get the ball out of his glove. And the inability to get the ball out of the glove was just the first of things that didn’t go right for the Sox in the inning — both Saltalamacchia and Breslow subsequently had errors charged after some interesting defensive plays gave the Cardinals a 3-2 lead following a Matt Carpenter sac fly to tie the game. Back to the double steal: it was the third time in Cards World Series history they have done it. And check out this graphic from Fox Sports Midwest — that first one is a little hard to believe, isn’t it? Lesson five: Pete Kozma is sorry for his Game One sins. Awesomeness of the double steal aside, he would like to show you just how sorry he is by making this terrific bare-handed play to throw Stephen Drew out. In case you weren’t convinced, he also threw out Xander Bogaerts right after that to end the inning. Can you forgive him? Lesson six: The Cardinals have a really good closer too, national media. Yes, we know that Koji Uehara is terrific and that he was the ALCS MVP. Can we introduce you to Trevor Rosenthal? He only needed 11 pitches to strike out Jonny Gomes, Jarrod Saltalamacchia and Daniel Nava and earn his first World Series save. Enjoy all three Ks again — it won’t take long, and it never gets old seeing Trevor throw heat. So now the scene shifts to St. Louis for Games Three through Five, starting tomorrow night at 7 p.m. Central. Joe Kelly takes the mound for the Cardinals against Jake Peavy for the Sox. This entry was posted in 2013 Season and tagged Boston Red Sox, Carlos Beltran, Jon Jay, Matt Carpenter, Matt Holliday, Michael Wacha, Pete Kozma, Postseason 2013, St. Louis Cardinals, Trevor Rosenthal, World Series by Christine Coleman. Bookmark the permalink.